I have taken a few weeks lately to chatter about other stuff. Let me stop and say thanks for all the comments regarding the music; interestingly I came across this little article about the Beach Boys this afternoon….seems to flow with my ideas a bit. And for our anniversary good wishes, we thank you too!!! We took a mini vacation to Myrtle Beach for our anniversary, and that was, overall, a lot of fun! But, now, back to the flinging. I am spending too much time, I think, worrying about the minutiae of this as an exercise, and missing the big picture. (This isn’t atypical for me—when I used to draw, I could get lost in the iris of an eye, and forget all about finding the shape of the face.) Being detail-oriented instead of looking at the overall scheme can be a failing sometimes! I have no problem planning, plotting and executing redecorating a space, but keeping the floor swept?? So, while I have been flinging, and divesting myself of things, I am still bringing things in. And I am not capable of getting rid of as much as is needed to really SEE a difference. (At least to me.) After all, I still have clutter. I still have things that aren’t ‘necessary.’ And so, I stop —finding the will to continue fade, seeing this as a never-ending battle between wants and needs. Basic economics 101, of the emotional sort, I suppose. I am not looking for a minimalist lifestyle. I can admire that goal for others, but I do like my ‘things’. And I ‘do’ too many types of art/crafts, have too many ‘interests’ if you would, that take from me the desire to spend non-work time cleaning, and divesting. I’d rather any day sit here and fiddle with Photoshop than organize a shelf! As I said, I like my things. And that includes my clothes, even if they are mostly from Goodwill. I guess the best thing is to stay out of there, too!! Truly, I end up wearing (when not at work) the same old same old. But I like to have my pretties, and after bringing down my summer clothes, find my hanger situation back where it was pre-fling!! This time is harder, because I LIKE everything left, and it FITS, it all seems to match/blend and is in good repair. The problem? I saw those empty hangers and found it acceptable to wander through Goodwill. I came up with a few cute outfits, great colors, and they cost under $15. And no hangers to hang them on. Sigh. Add to that the fact we had a “mega-blow out, I had no choice but to buy” paintbrush and acrylic paint extravaganza at work last week. I now have to figure out WHERE to store this bonanza, and more to the point, I need to finish this flinging and STICK with the tenets of some level of simplicity if I am ever to USE all my wonderful new toys…. So, into the studio I go. Holler for me on occasion, will you? Make sure I haven’t been buried alive under all my wonderful THINGS??? I foresee a great divesting, and a great pain. (Or simply a great failure to do anything.) It is impossible that I will ever ‘use’ all that I have here, and it is impossible that I will be able to avoid adding to it—there are too many wonderful colors and patterns and ideas in the world. Maybe I need to sell some things? Etsy, here I come? With cute little packages and piles of pre-organized color and fun?? Can I do it? I guess I need to start with a photo, huh? This is the view (somewhat already pulled apart….) 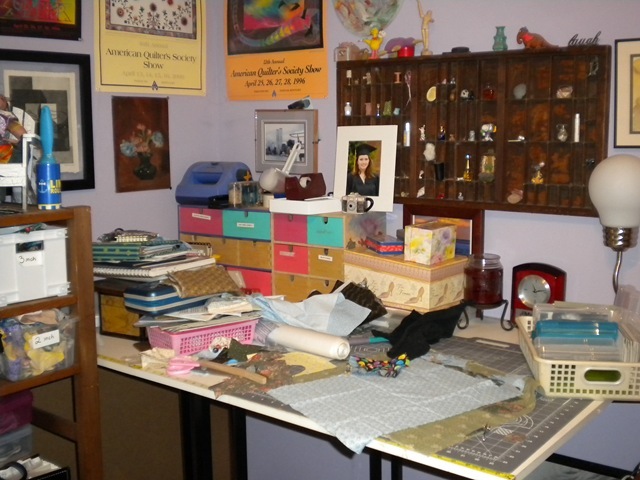 of one corner of the studio…..
….complete with abandoned quilt challenge…..BIG SIGH….. Wish me luck, offer me encouragement and tales of success, will ya??? I have never known anyone in my life that is in such wonderful disarray, so aware of it, and yet so content with it. Happy about it in fact. My garage looks no better despite having only two general purposes. Maybe you should have considered juggling? You are very,very good at it where your “things” are concerned. I love you dearly, and all of your diversity! I think it is best to draw a line. This far and no further. I will be very happy to fling and organize all the house. Then I’ll be happy to keep the playroom contents somewhat organized and corraled within the confines of the four walls of said palyroom. your studio is the same size as mine and looks far neater than mine. I doubt that I will doing much flinging from it… am very attached to my stuff!